Everyone is on their honor to conduct themselves according to the rules and within the spirit of competition. Have fun. It’s only a tag. 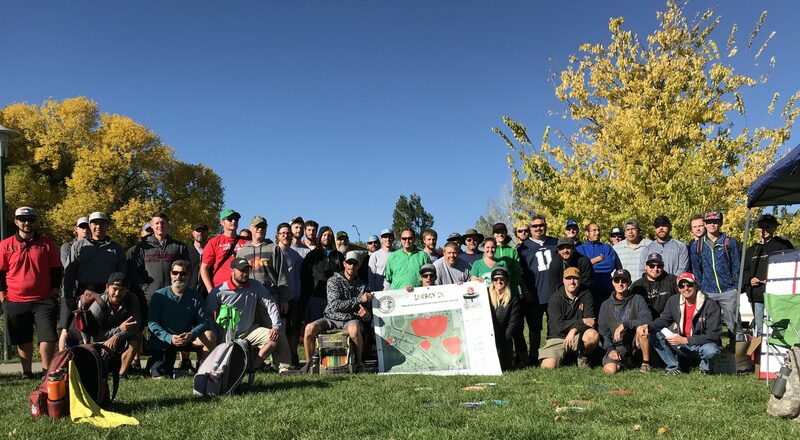 The purpose of the Bag Tag Challenge is to encourage friendly competition among Longs Peak Disc Golf Club members and Bag Tag Challenge participants. In order for the Bag Tag Challenge to work, all challenges must be accepted. Each player must have their Bag Tag at all times. Bag Tags must be plainly visible and can not be hidden. Challenges are to be made by choosing times and courses that are reasonable. Friendly side wagers of any kind can be made at the discretion of the participants, but are NOT required. Challenges will run throughout the “tag year” which roughly falls between January 1st and December 31st. The higher Bag Tag challenges the lower Bag Tag. Challenges can be by phone, computer, or in person. The challenged player picks the course, tees and format. Format choices include: stroke play or match play but no doubles/triples etc. of any kind. PDGA rules apply. If the challenger wins the round, the tags are exchanged. Ties are won by the holder of the lower bag tag at the beginning of the round. However, if ALL players agree before the round starts; a play-off hole(s) can be used as a tie-breaker using sudden death rules. You don’t have to play back-to-back challenge rounds against the same player or in a multi-player match with the exact same opponents. A player can’t challenge you, lose to you, and immediately challenge you again for another round. However, if ALL parties agree, consecutive round challenges are allowed. Challenges MUST be verbally agreed upon at the beginning of EACH round. Incomplete round: If a player does not complete a bag tag challenge round, the exiting player should trade tags with the player with the highest tag number. If play is stopped by all players before the round is complete, no tags are exchanged. This could be due to hazardous weather, physical emergency or mutual agreement. Multiple people at the same course at the same time can have a group challenge with 5 or less playing in the group. If more than 5 are present the group must split into cards of at least 3 and play proceeds as if it were a tournament/league. The tags are thrown into a pool and distributed by score at the end of the tourney/league not round by round. No sudden death to decide ties. Players using different tees in tournaments are competing against only other players using the same tee. Tag Order will also be readjusted after every Wednesday night League rounds. The winner of the challenge is responsible for reporting the results of the challenge. Members can purchase a new tag for $10.00 and will receive the lowest numbered tag available.